Wow, there are some interesting sake here! We have the driest one, the funkiest one, the cloudy one, the ancient one and the aged one all in one selection! If you want to discover how diverse sake can be, look no further than here; this selection is guaranteed to blow your mind. Heavenly Brew – a super dry Honjozo Genshu from Michsakari. Think: smooth, delicious, light and bone dry. Purple Warrior – a funky Yamahai Junmai from Hayashi Honten. Think: caramel & cooked fruits, crumble; rich flavour. Misty Mountain – a crazy fun, semi-cloudy Junmai Usu-nigorizake from Tsuji Honten. Think: sweet & sour with zesty & peppery flavour aftertaste. Golden Amber – a rich, 12-year aged Junmai Koshu from Hayashi Honten. Think: deep, rich, layered, mature, complex. 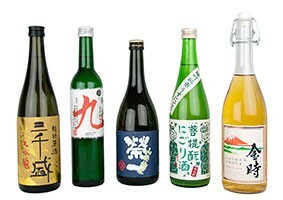 Each one of these sake will delight and surprise your taste buds! Go on a voyage of discovery with the Full and Funky Sake Selection. Allergens: Heavenly Brew & Golden Amber my contain gluten (discover why).